Being a caregiver for a senior adult can be extremely rewarding, but it’s also extremely difficult. Most caregivers – approximately 75 percent of them – are family members who haven’t been professionally trained for their duties. Many of these individuals entered into the role without completely understanding what exactly it would entail. Here are five common mistakes that caregivers can make, and what you can do to avoid them. 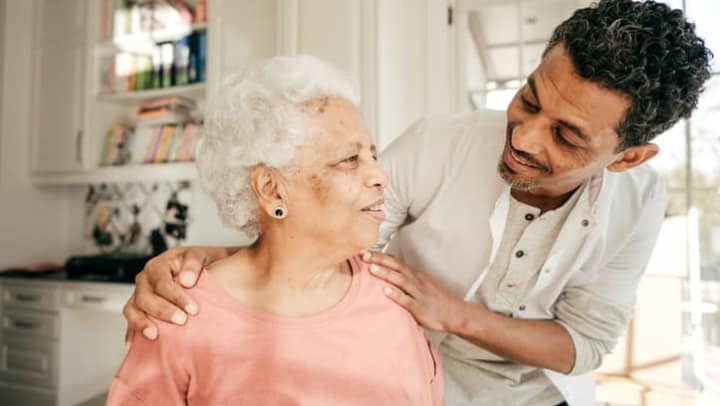 It’s natural for family members to instantly step into a caregiving role and reason that they’ll “figure out everything as I go.” As we mentioned before, this is an admirable gesture, and stems from a place of love and a desire to help your loved one in any way possible. However, when you jump in with both feet, you may suddenly realize the water is a lot deeper than you realized. Before you know it, you’re feeling like you’re not making a lot of headway. Don’t be afraid to reach out and ask questions. A lot of them. As many as you can think of, and sometimes ask the same ones more than once. It’s completely natural to feel lost and overwhelmed, so let go of guilt or shame that you don’t know enough or aren’t doing enough. A great thing you can do for yourself is join a support group, whether in-person or online. Being surrounded by experts and other caregivers who’ve gone through what you’re experiencing can give you the confidence and information you need to make thoughtful, clear decisions. How hard can caregiving be? you may ask yourself. Before you know it, you’re taking on more and more … and by the time you think to ask for help, there’s been some sort of a crisis that needs to be resolved yesterday. To save yourself heartache and stress, realize your limits before you get there, and ask for help from friends and family well in advance. Caregiving can start out easy, but quickly become difficult as the day-in, day-out tasks build up. Recognize that asking for help isn’t a sign of weakness, but a form of strength. Think of specific things other family members can help out with, whether that’s dealing with financial aspects, spending time with your loved one once a week or helping you run errands. You may be surprised at how readily your friends and family members will jump at the chance to assist you. You know what they say about all work and no play. Taking some time for yourself is essential in helping you be the best caregiver possible. Even a brief walk around the block can be enough to get you out of your head and help you feel better. While it may be hard to do at first, find time each day to do something that recharges you, whether that’s a catnap, spending 10 minutes reading before bed, having a cup of coffee on your porch or calling a friend. Just as your loved one’s health issues don’t change them as a person, being a caregiver doesn’t change who you are, either. Find what gives you joy so you can recharge your batteries on a regular basis. Burnout is a very real issue affecting caregivers, and left unchecked can cause a slew of health issues – physical, emotional and mental. This leads to you being unable to care for your loved one in the best way possible. If you’re experiencing a lack of energy, depression, changes in your eating habits, feeling hopeless or unable to cope with everyday tasks or even simply feeling like caregiving has taken over your life, take steps to get the help you need. Of course, the best course of action is preventative, so if you can get help before you reach this point, so much the better! There are many resources available to caregivers to help provide the support and assistance they need to avoid burnout. Talk to your physician and see what medications might be useful for you. You can also connect with your area’s Agency on Aging and get information about senior day care programs, respite care and care aides who can help give you a much-needed break while giving your loved one the best care possible. 5. Making Promises You Can’t Keep. “I’ll never put Mom in a home.” “I’ll handle every aspect of Dad’s care – no one else needs to worry about it because I can provide the best care possible.” Making promises like these will set you up for failure, make no mistake. Caregivers tend to make promises like these to their loved ones in good faith because they want to be able to give their loved one what they want. However, none of us know what the future holds, and if these promises have to be retracted for whatever reason, this can lead to a lot of guilt or resentment. Understand that plans can change, and that you may need to take steps like moving Mom or Dad into an Assisted Living community. Be gracious to yourself and your loved one and realize that the most important promise you can make is to provide the very best care for your loved one now and in the future. Caregiving can be a difficult role, but you don’t have to go at it alone. At Azpira Place® of Lake Zurich, we provide support and assistance to at-home caregivers in order to help give their loved ones the best quality of life possible. We are also a compassionate, professional community dedicated to providing a fulfilling, uplifting and engaging lifestyle for our residents, no matter what their health needs may be. We would be happy to help you or a loved one see how senior living can enhance your loved one’s life while improving their health. Call us today to schedule a tour at 847-438-6100. Azpira Place® of Lake Zurich was designed to give seniors the tools to live the fulfilling lifestyle they desire. Here, residents never have to worry about housekeeping or maintenance, and they always have peace of mind knowing care is available whenever it’s needed. That leaves time for enjoying the things that they want to do. With VIVA!SM programming by Pathway to Living®, residents can live their days how they choose, whether they want to be active or simply relax. Take advantage of an array of health and wellness programming, learn something new, share a talent or skill with others within the community or relax in your private apartment. No matter what, there’s no shortage of ways to live well, age well and be well.